Allisongs for Tots - Fun Music Classes for the Whole Family! Have fun with your child every week! Introduce your child to music! Share your love of music. So many reasons to love our classes. Canta y Baila this Spring! We are so happy to be offering the Spanish language music and movement class, Canta y Baila Conmigo, starting this Spring. Designed to be accessible to ALL families, Canta y Baila Conmigo immerses your family in Spanish language, music and culture. Learn more. Did you know that Ms. Alli is also a children's book author? Monsters are Afraid of Music and Angels Watching over Me are designed to empower children through song. Take a look at how this joyful, little gal practices her bedtime ritual of chasing away the monsters! Ms. Alli has 3 additional sing along stories, What is A Snore For?, At the Low Hoe-Down and Good Night Family, coming soon. You can purchase Ms. Alli's books in our store. Allisongs is so happy that your family is a part of our community of music makers! If you love classes at Allisongs for Tots, would you be so kind and write us a review on Google? Please click here to write a review. 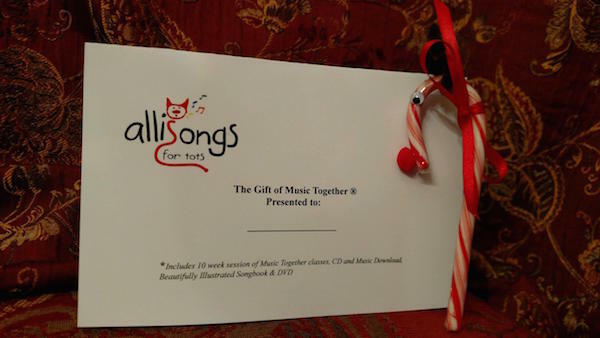 An Allisongs for Tots gift certificate makes a great gift from Grandma & Grandpa! Contact us to purchase a gift certificate. If you chose the "Pay Later" option when you registered, you can still pay online to guarantee your spot in class. Use the "Make a Payment" page in the "For Registered Families" menu. Some of our classes are full and there are families waiting for a spot to open up. Click here to make a payment now! Visit one of our classes and see if the Music Together program is a good fit for your family. Sign up for a free demo class. Let's Make Music Together® in Tampa! Since 1987, Music Together has introduced millions of children, parents and caregivers to the joys of making music. Our research-based curriculum is now taught in more than 2500 locations around the world, including right here in Tampa at Allisongs for Tots. Every week in our music classes at Allisongs for Tots, babies, toddlers, preschoolers, and the grownups who love them come together to play musically. Little ones love playing along in class, and caregivers love being a part of their children’s growth into confident music-makers. And everyone loves our songs that’ll have you tapping along in no time. Music Together is the perfect family activity in Tampa! Copyright 2019 Allisongs for Tots. All rights reserved.